Legal internships provide an opportunity for students to increase their knowledge of substantive areas of law, gain exposure to a real work environment, and provide valuable support to a legal employer. An increasing number of law schools, paralegal programs, legal secretarial schools, and other legal educational institutions require the completion of an internship as a prerequisite to graduation. Some internships are paid although many are not. However, most internship programs allow students to earn school credit. As the legal field becomes more complex and legal employment opportunities proliferate, the traditional internship has evolved. Now a number of different experiential opportunities for the legal student exist including judicial clerkships, legal clinics, summer clerkships, legal externships, and pro bono projects. These programs place students in law offices, courts, and public interest organizations with the goal of providing real-world legal experience under the guidance of faculty members, licensed attorneys, and sitting judges. While your school’s career center is the first place you should look to find an internship, a number of internet sites also maintain lists or links to internships. Judicial clerkships are among the most popular law school internships. Students intern for state and federal court judges and gain valuable insight into the workings of trial and appellate courts. These positions are very research and writing intensive and are excellent resume-boosters, especially for those who wish to practice civil or criminal litigation or appellate law. Judicial interns perform a wide range of clerkship duties including reviewing appellate briefs, trial records, and other documents; researching and analyzing case law; assisting in the drafting of bench memoranda and opinions; making recommendations regarding the disposition of matters on appeal, and briefing the judge prior to oral argument. Students applying for judicial internships must demonstrate exceptional research and writing skills, sound judgment and strong interpersonal skills. Students seeking federal court clerkships generally must have a superior academic record. Federal judicial clerkships (clerkships with one of the nation’s circuit courts) tend to be more prestigious, and thus more competitive, than state court clerkships. Clerkships with the United States Supreme Court are the most prestigious and sought-after clerkship positions. Legal clinics allow students to gain legal experience through clinics located within the law school. Legal clinics offer an opportunity for second and third-year law students to apply classroom knowledge to real-life legal situations. Students perform real-world legal work under the supervision of a faculty member and/or practicing attorney. Examples of legal clinics include representing abused children in juvenile court, litigating fair housing cases in federal court, conducting real estate closings for Habitat for Humanity, or drafting a will for elderly clients. Clinics are a good option for students who cannot afford the time away from the academic program required by a paid internship or by those unable to find a source of payment for the internship. Externship programs offer students the opportunity to work in practice settings outside the school. Through an externship, students can gain real work experience in specific areas of interest. For example, students interested in health care law can perform an externship in a hospital’s in-house legal department. Students interested in family law or children’s rights can work for a Court Appointed Special Advocates (CASA) program. Students seeking litigation experience may complete an externship with a state prosecutor’s office or the U.S. Attorney’s office. Students with an interest in public interest law can work at an area legal aid program. Students wanting to concentrate in employment law or civil rights issues may extern with the Equal Employment Opportunity Commission or the U.S. Department of Labor. Students in externships programs are usually supervised on-site by a licensed attorney who assigns specific tasks and provides oversight and feedback. Full-time faculty members and staff may also provide additional oversight and supervision. Although some externships provide financial compensation, more often an externship is offered for school credit. Externships provide students the opportunity to serve the public, make valuable contacts in the field, learn about the rigors of daily practice in a specific field of law, and acquire valuable legal skills. The summer clerkship is the quintessential law school experience for many aspiring attorneys. Summer clerkships are the ticket to a job with many of the largest, most prestigious law firms. For this reason, summer clerkship opportunities are limited and competitive. Many of the larger law firms base clerkship hiring decisions on superior academic performance and/or law review experience. Most summer clerkship programs commence at the end of the law student’s second year, last 10 to 14 weeks, and end at the close of the summer. However, some clerkships may be offered during the school year. While the large majority of clerkship programs exist in large law firms, a number of clerkships opportunities can also be found in small and mid-size firms as well as corporations, the government, and the judiciary (see judicial clerkships, above). Summer clerkships in large law firms are often very research and writing intensive since that type of work is more easily delegated to summer staff than complex, long-term projects. 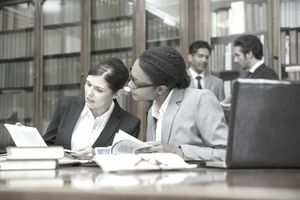 Some of the larger law firm and corporate employers have well-developed summer clerkship programs that include periodic reviews, social events, mentor assignments, and a well-established method of allocating assignments. “Pro Bono” means “for the good of the people.” Students performing pro bono projects help to serve marginalized communities and underserved populations – such as children and the elderly - that are often denied access to justice. Pro bono work is another excellent way to serve the public while developing your legal skills. Pro bono work is encouraged, though often not required, by both law schools and legal employers. A wide variety of public service awards exists for students and employees who perform pro bono work. Pro bono work is also a great credential for your resume. No matter what type of internship you participate in, you are certain to build your legal credentials, make valuable contacts, and refine your legal skills. For many students, participating in an internship, externship, summer clerkship, or legal clinic is one of the most rewarding experiences of their legal education.